Last year, ICG Sponsors Accra Golf and Cool Clubs S3 simulation profiling machine was the technological center of our presence at the Show. This year, ICG Sponsor, Advanced Profiling System (APS) will take center place. APS is offering a free year of ICG membership to anyone purchasing a machine. Price is $899 (Auditor must be supplied by purchaser) plus shipping. See the APS in action with inventor Roy Kaltz and ICG Hall of Fame member Jerry Hoefling, Sr. here. We have a couple more sponsors who have made verbal commitments which will help us achieve our 2nd sold out Show in a row. Missed 2015’s PGA Show fun last year? Here’s some video highlights of last year’s Show which should give you an idea of our success last year (including signing up 5 new sponsors, 67 new members, and 73 renewals). To approach last year’s success, we’ll need volunteers. Europe VP Gerald Friz has created an online form where you can sign up to volunteer in various time segments. You can also access via your member center landing page or here after logging onto our site. Initial poll results indicate that one third of our active members will be there and volunteering. If everyone just donates 2 hours of their visit, we’ll be on our way to matching or topping last year’s overwhelming success. We really need more members attending the Show to help out. And please don’t think we’re resting on our laurels. Last year, we were the first clubmaking/fitting organization to participate at the PGA Show Demo Day, had a great meeting room at the Orange County Convention Center, and we debuted our Clubmaker of the Year (COY) awards, and ICG Clubfitting Certification. 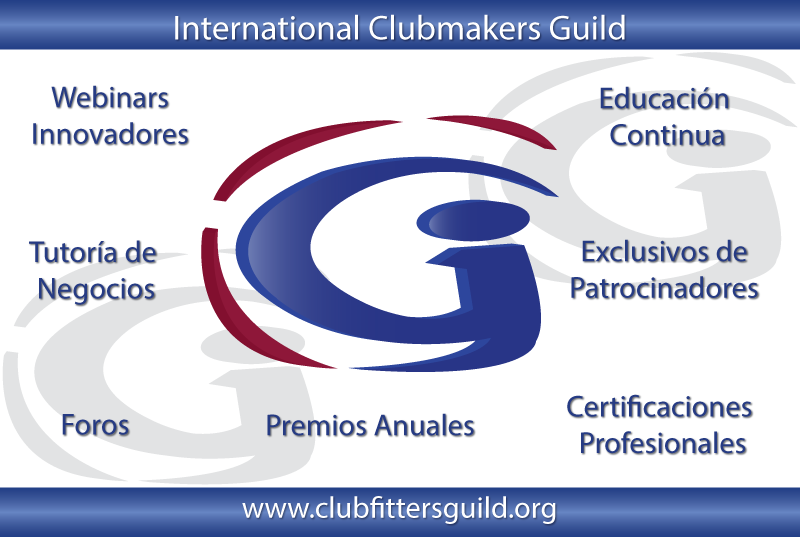 At the 2016 Show, we’ll be awarding our 2016 COY awards, inducting our 2016 HOF Class, announcing our first online training course, introducing our process for becoming eligible for our International top list of ICG Clubfitter/Makers, and announcing our clubmaking/clubfitting exclusive partnership with GolfMds. The Europe Chapter of the ICG held its first ever meeting (Mallorca, Spain). Here's a brief summary of the meeting's highlights. The first European Chapter Meeting was held at Mallorca, Spain on the 27th and 28th of November, 2015. 35 attendees from Spain, France, Italy, UK and Germany met in Las Palmas to share their experience in clubmaking/clubfitting and to make professional contacts. A lot of fun but also a lot work was waiting for the members.Perfectly organized by our Spanish clubmakers Agustin Sanchez (Clubmaker of the Year 2015 Europe) and Miki Rapado (ICG Advisory BOD), the conference started with a round of golf at Real Golf Bendinat. Saturday was a 12 hour working day with morning presentations about putter fitting and technical equipment. In the afternoon there were presentations of products and services by our meeting sponsors Amara Golf Foresight, Science & Motion, Gripgolf, Grindworks, Trackman and ICG Sponsors Accra Golf and Big Fish Golf . The conference finished with roundtables discussing shared interests professionals from different countries. The next chapter meeting in 2016 will be enriched with workshops and breakout sessions to give the professionals the possibility to discuss topics in depth – one day was just too short to cover all needs. So look forward to a 2-3 day meeting - perhaps in the United Kingdo! Reporting from Europe - Agustin Sanchez (ICG BOD member) and Gerald Friz (ICG Europe VP). Watch highlights of Agustin’s meeting here. 2. ICG Webinars, COY and HOF Awards. Golf Digest Best 100 Clubfitter and ICG Distinguished Service Award winner, Frank Viola, and new ICG Sponsor Bill McPherson of Graphite Design/Pro Choice Golf Shafts conducted a great webinar - attended by 38 members - in November. Enjoy a 10 minute clip on our home page. ICG Members can watch the entire fully close captioned webinar by following this link. Frank also recently had ICG Sponsor Authenticlub’s webinar fully close captioned as well. John Dranschak - 2016 ICG Midwest US Clubmaker of the Year. Click on the members names to access their web sites. ICG members can view COY videos under the members only section. One of the byproducts of the Europe Chapter of the ICG Meeting, is that 75% of forum posts since November have been in Spanish. The ICG continues to put the I in International. Check it out here and here! In recognition of a growing demand from our increasing presence in Spain, and hopefully in Latin and South America down the road, the ICG BOD has agreed to translation of the ICG Certification Test Bank into Spanish. This is certainly in line with our mission of promoting clubfitting and club making world wide. Look for ICG Member, Show Specials, and more updates in our Pre PGA Show Clubfitter Digest in about 4 weeks, and our PGA Show Report Clubfitter Digest in about 8 weeks. JOIN NOW- If you’ve learned anything at all about us in the last couple years - we’re not your Grandfather’s clubmaking/fitting organization. Join us, you won’t be disappointed!